Squirrels belong to the rodent family. 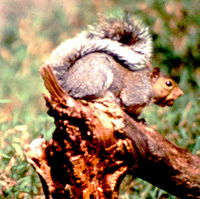 Gray squirrels are located throughout much of eastern and central United States. Although found in Pennsylvania and New Jersey, red squirrels range much further north through most of Canada and into the Rocky Mountains in western United States. Gray squirrels are considered a game animal which means there is a hunting season on them. Red squirrels are not a game animal. Gray squirrels are 8 to 10 inches long from head and body. Their bushy tails are as long as their bodies. The red squirrel is about 2 inches smaller in both head and body and tail. Of course, as their name states, the fur on gray squirrels is more grayish and the fur on the red squirrel is more reddish. Both kinds of squirrels have whitish fur on their chests and stomachs. Both kinds of squirrels have two litters of 3 to 5 babies per year. Both kinds of squirrels mate in late winter and then during the summer months of June and July. It takes about 44 days for gray squirrel young to develop and 38 days for red squirrels. Both types of squirrels are born blind and naked in tree nests. Squirrels build two kinds of nests -- one is within tree holes and the other is a leaf nest within the branches. Most likely, the first litter of squirrels will be born within the tree hole. The second litter will be born within the branch nest. Baby squirrels feed from their mothers' milk for about two months. Then, they are on their own. Gray squirrels can live up to 15 years in zoos. Red squirrels live for about 10 years. In the wild, both kinds of squirrels are food for birds of prey and other predators, such as foxes. Both kinds of squirrels are active the entire year. 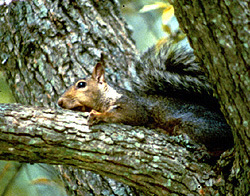 Gray squirrels live near hardwood trees in forests that produce nuts such as acorns. They also live among trees in protected places such as college campuses, parks, and the Harrisburg State Capitol area. They never travel too far from trees. Red squirrels live in mountain forests of pine and spruce trees (conifers) and mixed hardwood forests. Sometimes, they live in swamp forests. Gray squirrels eat many kinds of nuts, seeds, fruits, and the bark of trees. For winter food, they hide nuts and acorns in small holes in the ground. Some acorns are never found and they sprout to grow into oak trees. Gray squirrels also "steal" bird seed from bird feeders. Red squirrels also eat a variety of nuts, seeds, and birds' eggs. They store their food differently. They will bring their winter food to a favorite log or tree. They will gather pine cones or nuts in piles of a bushel or more. They also eat some mushrooms that are very poisonous to people. Both kinds of squirrels are grouped as herbivores.